Changing the motor oil in your vehicle is probably the most important maintenance service that you can perform. Oil lubricates the engine, absorbs the heat that is created through friction, and keeps all parts and components working efficiently and lasting longer. In our professional opinion and the manufacturer recommendation, you should change conventional motor oil every 3,000 miles or 3 months; synthetic oil, every 5,000 or 5 months, whichever comes first. In many models, your car will tell you when it is time to change the oil. In any event, our technicians will place a sticker inside the windshield to remind you when the next oil change should take place. When it is time for your car to have its regular maintenance and oil change, AutoWorks is your trusted, professional, and friendly auto repair shop for all your auto needs. And we are conveniently located off Congress Avenue in Delray Beach. 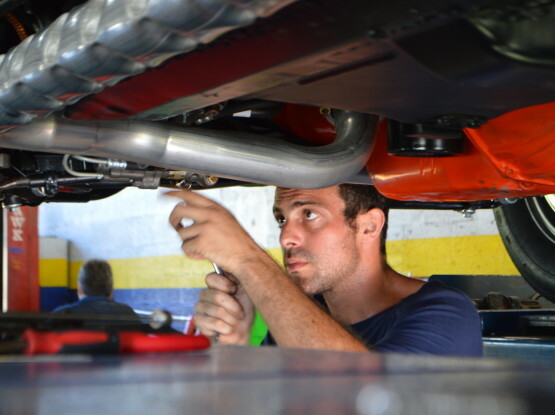 We provide fast, efficient, and competent oil changes to get you in, out, and on with your day. Many people tend to only focus on the mileage of their car opposed to the vehicle’s warning signs. Your car can tell you if it’s time to have an oil change, and sometimes that could be before the recommended mileage number. One of the top signs that oil is old and needs changing is if it is dark. Dark oil indicates that it is dirty. How does oil get dirty in the first place? Over time, motor oil breaks down and becomes contaminated with dust, dirt, and debris from the engine as well as the environment. If your car’s engine is making loud noises, such as knocking, it’s time to visit an auto repair technician. The engine oil is a protective barrier against metal-to-metal contact. When the oil begins to thin, it can create some nerve-wracking noises. Really, it’s your car’s engine telling you it’s time to take it to the repair shop. Additionally, your car’s Check Engine light may come on. Although that can indicate a number of issues, there’s a good chance that it’s related to motor oil that needs to be changed. Some vehicles even have a designated oil light, which makes it easy to know when your car is in need of some maintenance. Exhaust smoke and oil smells within the vehicle are two sure signs you need to take your car to an automotive expert. When you can smell oil, it means there’s a leak. That’s not something you’ll want to be driving around with, so bring your car to AutoWorks today. AutoWorks is an independent, full-service auto repair shop that offers fast and efficient services, labor warranties, and parts warranties. We’ll even give you a free visual inspection, honestly letting you know if anything seems to be amiss. If you need an oil change in Delray Beach, don’t hold out. It’s dangerous, damaging, and negligent. Instead, make the most out of your car, truck, or van’s life by making regular visits to our ASE-certified technicians. Call 561-272-7451 today to schedule your appointment. Previous Post How Important is a Regular Oil Change in Delray Beach?